Moochelle overseeing unpaid White House field hands. We've been instructed by the Obamunists that requiring a photo I.D. of voters is racist and a suppression of voters' rights. However, it has been revealed by a White House blog that those wishing to obtain an autographed copy of Mrs. Obama's book, telling us how we should be eating, are required to do much more. 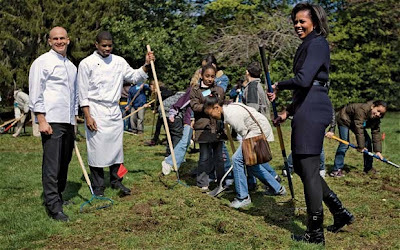 Mrs. Obama will visit a Washington, D.C. Barnes & Noble on June 12 to autograph copies of her book about the White House kitchen garden. Beginning on Friday, June 8th, those wishing to attend the book signing must purchase a copy of the First Lady’s book at the location (for $19.20) and leave it at the store, according to an employee. At the same time, customers must also submit their social security number and show an official photo ID (drivers license, passport) to a Secret Service agent; they will then be issued a wristband permitting them to attend the First Lady's event. Book sales and wrist banding begin at 9:00 AM on June 8. For victims of this racist screening, we recommend the Food Channel and Paula Deen.